Yale University is one of the most frequently searched colleges in the United States, according to a recent internet keyword search of American universities. Yale is a private Ivy League research university in New England, situated in the state of Connecticut. Founded, believe it or not, in 1701, Yale is the 3rd oldest college in the United States. In fact, in 1861, Yale became the first institution in America to award a PhD degree. Back in the day, Yale was a college for sons of the elite. 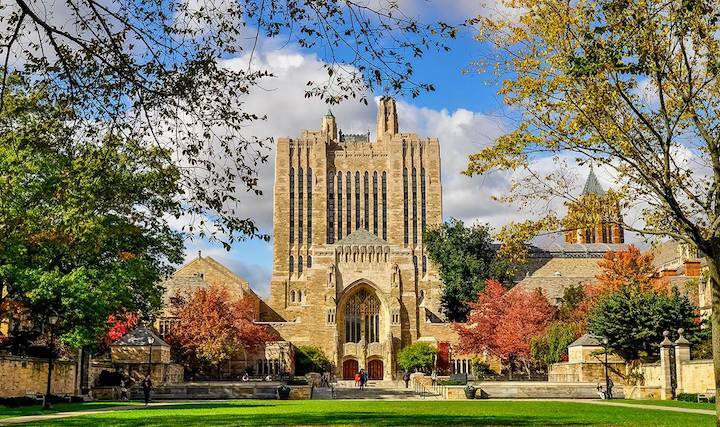 Today, Yale University maintains an enrollment of approximately 12,000 students each semester, with more than half of the school's undergraduates coming from public high schools. 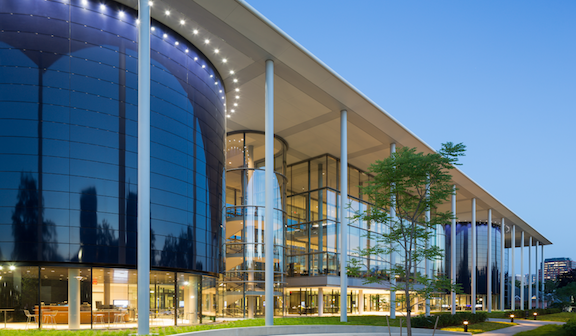 Yale offers undergraduate, graduate, and professional certificate programs. Yale consistently ranks 3rd overall among American universities. Only Harvard and Princeton rank higher. Regarding the acceptance rate at Yale, it is considered one of the most difficult universities in America to attend. Yale has an acceptance rate of only about 6.3%. But don't let that deter you from applying. Notable graduates of Yale include five U.S. Presidents, 60 Nobel laureates, no less than 20 living billionaires, and hundreds more inventors, star athletes, entrepreneurs, and other astonishing success stories. Here are the answers to some frequently asked questions about Yale University. 1. Where is Yale University? 2. What is the organizational structure of Yale University? 3. What undergraduate studies are offered at Yale University? 4. What graduate programs are available at Yale University? 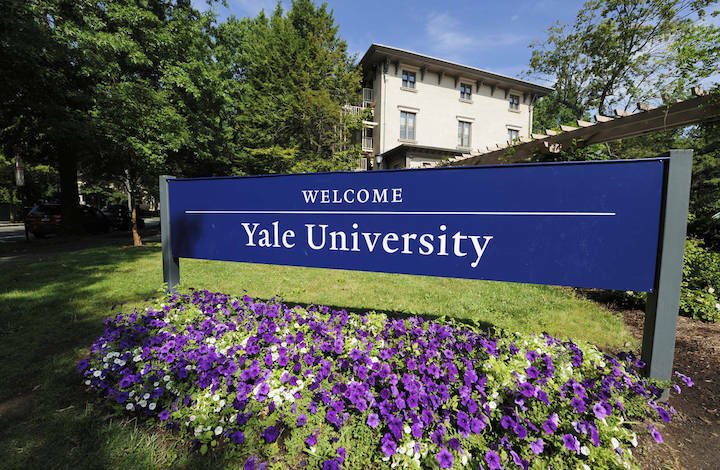 Click here to see a Complete List of PhD Programs at Yale University. 5. What programs are offered at Yale University Law School? 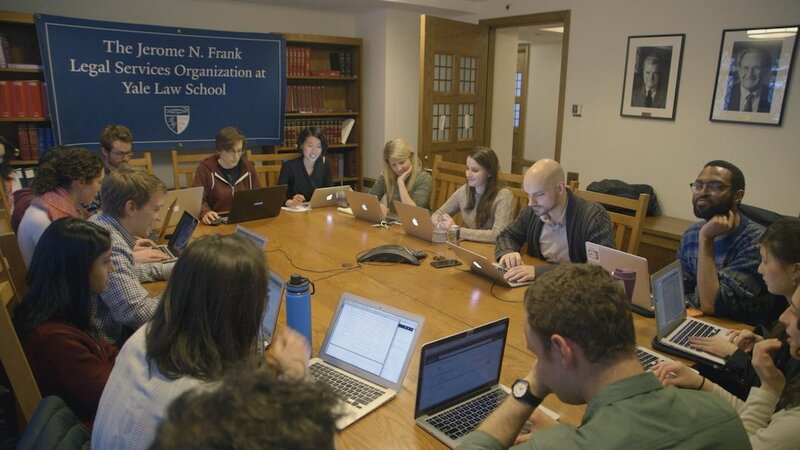 Above: A classroom session at Yale Law School. 6. How much does it cost to attend Yale University? Graduate school tuition at Yale varies by school and degree. Other fees may also apply, such as application fees, parking fees, technology fees, health fees, insurance fees, and others. Different types of financial aid are available, although undergrads must fill out the FAFSA form. Aid may come in the form of grants, scholarships, work study programs, or private donations. Most undergraduate students at Yale do not pay the full cost of tuition. 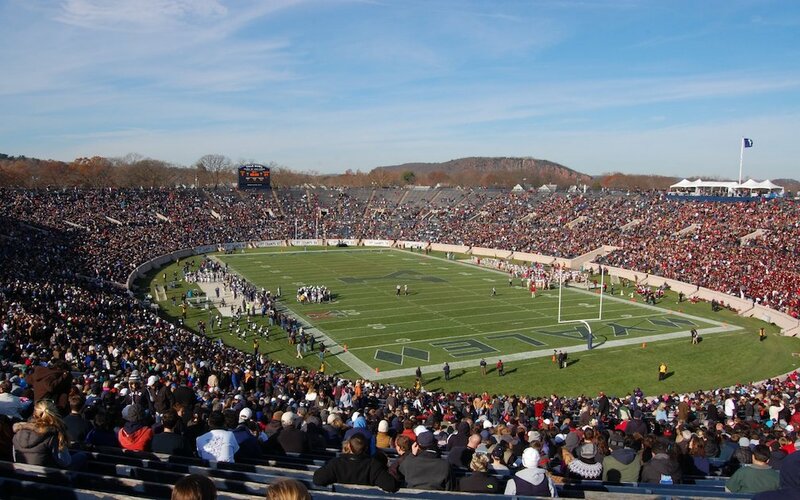 Above: The football stadium at Yale is one of the world's largest. 7. 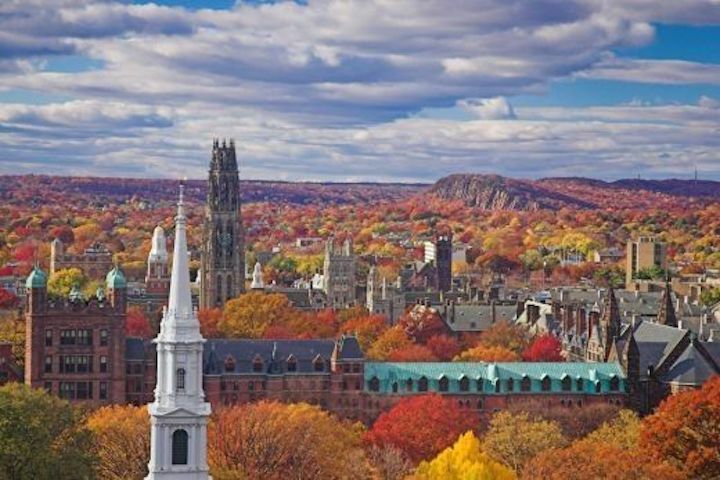 What is the Yale University campus like? The extended campus of Yale occupies just over a thousand acres in a convenient urban setting. The central campus spans about 260 acres, and is located right smack in the middle of downtown New Haven, Connecticut. The central campus sits adjacent to Yale-New Haven Hospital. 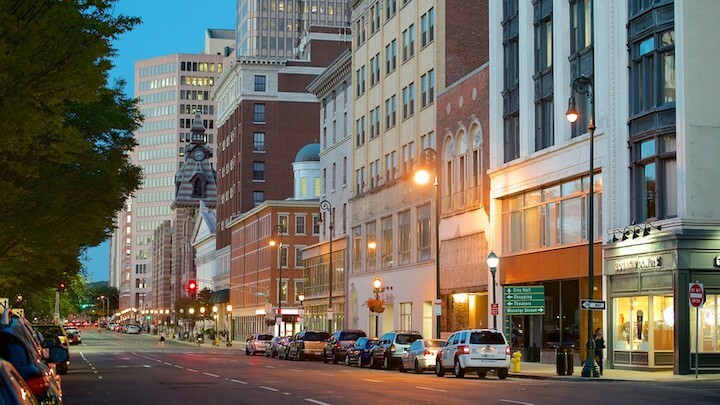 New Haven is a pretty little coastal city that borders the Long Island Sound, and is home to approximately 130,000 people. The Yale campus is characterized by tall, gothic-style structures, and is landscaped with meticulously manicured lawns. The grounds feature many wonderful works of ornately carved architecture, such as the James Dwight Dana House, the William Taft Mansion, the John Slade Ely House, and Connecticut Hall. Connecticut Hall, a Georgian style building, is the oldest building on campus, constructed in 1750. Other campus landmarks and attractions include the Yale Peabody Museum of Natural History, the Yale Center for British Art, the New Haven Museum, the Shubert Theater, the College Street Music Hall, and the Yale University Library, which is the 3rd largest academic library in America. Also nearby are quite a few clubs, cafes, markets, and affordable eateries. The school color is "Yale" blue. The varsity athletes at Yale are called the Bulldogs. They play for the NCAA Division 1 - Ivy League. Yale has more than 30 varsity athletic teams. Also available on campus are more than a few club and intramural sports, such as some of the ones listed above, as well as archery, fishing, skiing, rugby, and table tennis, to name just a few. Apart form sports, Yale University also hosts many hundred undergraduate student groups and organizations, in a diverse range of interests. Among the on-campus student groups are a dance club, and American Red Cross organization, an American Sign Language club, a Black Student Alliance, a Bookmakers Guild, a Chocolate Artisans Association, a Wilderness group, and many others. 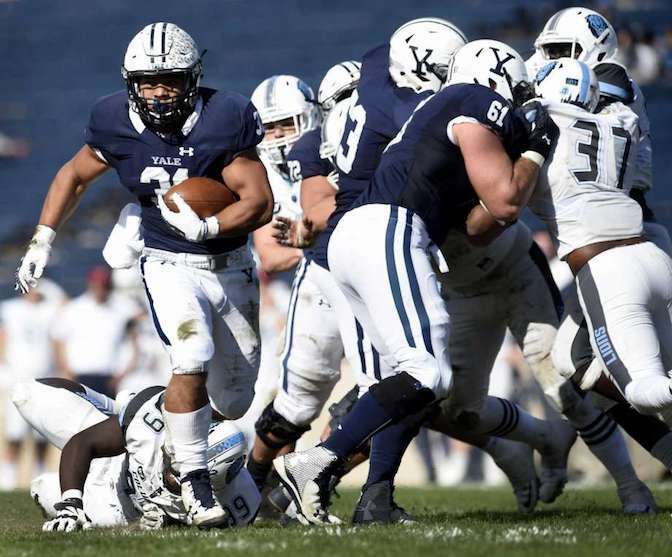 Above: The Yale Bulldogs football team in action. 8. What are the distance learning options at Yale University? 9. What is the contact information for Yale University? To reach the main campus of Yale, or for general information, call 203-432-4771. For the undergraduate admissions office at Yale, you can call 203-432-9316. To contact the Yale Law School, call 203-432-4992. For questions pertaining to financial aid at Yale, call 203-432-2700. Above: Downtown New Haven, Connecticut.